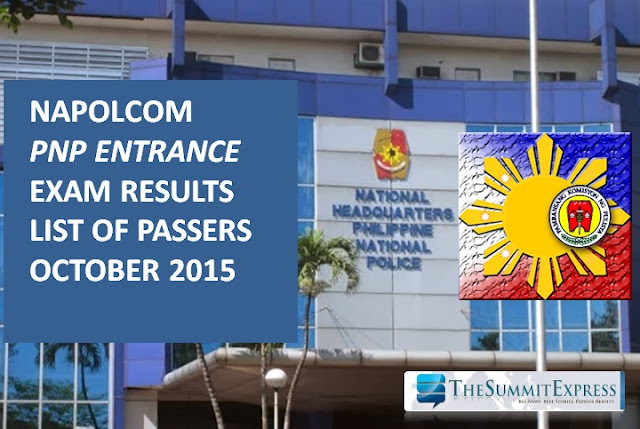 The National Police Commission (NAPOLCOM) has released today, January 8, 2016 the complete list of passers of October 2015 Philippine National Police (PNP) entrance exam. A total of 2,600 out of 14,860 examinees successfully hurdled the PNP entrance exam. NAPOLCOM administered the PNP entrace exam on October 25, 2015 in at least 24 testing centers nationwide namely: cities of Makati, San Fernando (La Union), Tuguegarao, Angeles (Pampanga), Cabanatuan, Malolos (Bulacan), Aurora (Baler), Tarlac, Calamba, Bacoor, Calapan, Legazpi, Iloilo, Cebu, Tacloban, Pagadian, Dipolog, Cagayan de Oro, Davao, Mati (Davao), Koronadal, Baguio, Butuan and Cotabato. The big chunk of examinees came from the National Capital Region (NCR) with 1,300 total examinees for the PNP entrance test. The three-hour entrance examination for PNP entrace covered questions on general information, verbal reasoning, quantitative reasoning and logical reasoning.